Happy Birthday E. K. Blair!! Have a fabulous day!!! Happy Birthday!!!!! I don’t have instagram but I did visit your FB page 🙂 Have a fabulous day!!!! I hope your family and friends bring you as much joy on your birthday as you bring to us, your readers! Happy Birthday I hope you have a great day! Happy birthday!!!!! Can’t wait for Echo!!!!! Happy Birthday E.K. I hope you have a wonderful day!! Happy Birthday…it’s also my birthday…have agreat day!! Love Bang…Dying for Echo….Hope you have a simply Fantabulous Birthday! happy Birthday… Mine is is 2 days! Hope you have a wonderful day and all your wishes come true! Can’t wait to read your next book! Happy Birthday EK! HAVE A FABULOUS DAY! With your book “Bang”, I made the most beautiful (mind trip) in my life! Sorry for my english, I’m italian! Happy Birthday EK! Hope your day is FANTASTIC! happy birthday!!! I’m so excited for echo to come out on my birthday! (May 12th) love your books! A very merry unbirthday e.k.!!! I hope you have an amazing day! Thanks for the chance to win this giveaway. Happy Birthday! Thank you for this AWESOME Giveaway! Happy Birthday E.K.! Cannot wait to read ECHO!! Happy Birthday E K Blair!!!! Have a wonderful day!!! Love your books! happy Birthday e.k.! Hope you have a wonderful day!!! Wishing you a very Happy Birthday!!! Thanks for giving my fellow readers and I a chance to win a gift on your birthday!!!! Happy Birthday!!!!! Can’t wait for echo to come out either can my book club ! 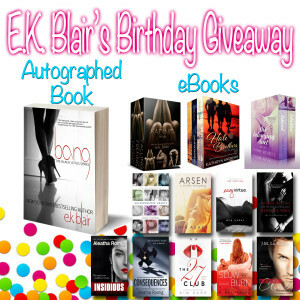 happy Birthday E k Blair. I hope you have a splendiferous day! happy Birthday. Hope you are having a good one! Happy Birthday! Today is my sister’s birthday too! Hope your day is fabulous! Happy Birthday!!! Thanks for writing Bang! It completely fucked with my head! Happy Dirty Birthday EK!!! Hope its awesome!! Happy birthday Ek!! I hope you have a fantastic day!! happy birthday!!! Hope it’s the best one yet! Have a fabulous birthday!!! thanks for the giveaway! Happy Birthday! Thanks for the great giveaway! Many Happy Birthday Wishes to you E.K.! Thank you for your awesome birthday giveaway! Enjoy your day! Happy Birthday!!! I hope your day is as absolutely fabulous as you are!!! Now get to writing!!! We need more of your books!!! Happy birthday. Thanks for Candance Ryan Mark and Jase. Happy Birthday and Thank you for a chance! Awesome Birthday giveaway! !